Formulated to promote the health and happiness of all large breed dogs – excellent for dogs with sensitive digestive systems. The diet’s nutritionally-dense kibbles and highly-digestible ingredients assist in mitigating digestive upset and maximizing nutrient absorption – helping large breed dogs maintain a healthy weight. To help ensure your dog’s nutritional safety, Best Breed pays a premium for EU-approved and natural ingredients. Further, Best Breed only uses ethoxyquin-free sources of fish and chicken raised without antibiotics and added hormones. 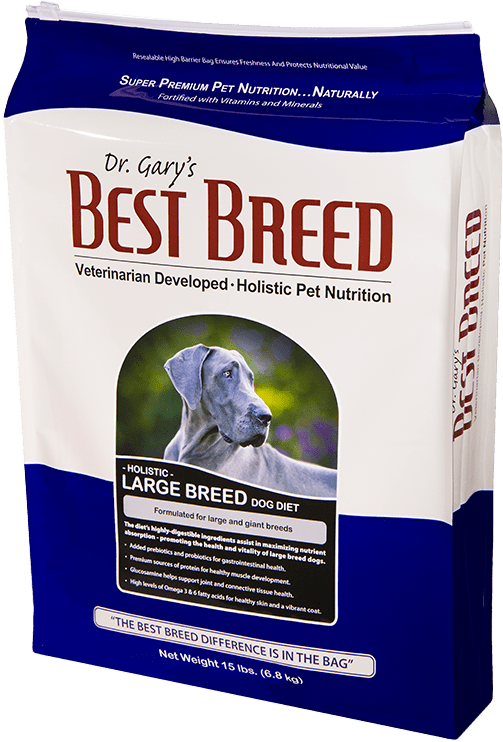 Best Breed Large Breed Diet is formulated to meet the nutritional levels established by the AAFCO (Association of American Feed Control Officials) Dog Food Nutrient Profiles for all life stages. This formula benefits dogs of all life stages (puppy through senior). One common misconception I would hear from clients is the idea that large breed dogs do not benefit from holistic nutrition as much as smaller dogs. I strongly disagree with this idea and believe that holistic nutrition is just as critical as they have a massive amount of skin and hair to maintain, tend to have more sensitive gastrointestinal tracts and often need special nutritional attention paid to their joints. The Large Breed Dog Diet has been developed with (i) high and balanced levels of omega fatty acids for optimum skin and coat health, (ii) healthy sources of fiber with prebiotics and probiotics for proper gastrointestinal functions and (iii) both glucosamine and the Green-Lipped Sea Mussel to assist in natural joint health. Further the food is made with small kibbles. The reason we did this is dogs are not natural masticators, meaning they do not mash their food up before swallowing – typically a dog will take one or two bites and swallow, so a lot of kibbles actually go into the stomach whole. The small kibbles are much easier to digest than the large ones as they have more surface area in relation to weight. In addition, the small kibble allows for the formation of a tighter mass of food, which may help reduce air pockets in the stomach – think of a jar full of BBs compared to a jar full of golf balls – which one has less air in the jar? Lastly, like all of our diets, the Large Breed Dog Diet is formulated without low-grade ingredients that are harder for your dog to digest and may be harmful to his health. Some of these ingredients include animal by-product meal, cheap fillers, any sort of gluten (e.g., corn gluten), and artificial preservatives, flavors, and colors. Please do not hesitate to contact me with questions regarding Best Breed’s Large Breed Dog Diet. Chicken Meal, Oatmeal, Brown Rice, Dried Beet Pulp, Chicken Fat [Preserved with Natural Mixed Tocopherols (Vitamin E)], Egg Product, Pearled Barley, Brewers Dried Yeast, Menhaden Fish Meal, Natural Chicken Flavor, Lecithin, Menhaden Fish Oil, Flax Seed, Canola Oil, Calcium Carbonate, DL Methionine, L-Lysine, Monosodium Phosphate, Salt, Cranberry, Alfalfa Meal, New Zealand Sea Mussel, Ascorbic Acid, Fructo-oligosaccharides (FOS), Glucosamine, Garlic Powder, Lactobacillus Acidophilus Fermentation Product Dehydrated, Kelp Meal, Vitamin E Supplement, Biotin, Niacin Supplement, d-Calcium Pantothenate, Vitamin A Acetate, Riboflavin Supplement, Vitamin B12 Supplement, Thiamine Mononitrate, Pyridoxine Hydrochloride, Citric Acid, Vitamin D3 Supplement, Folic Acid, Potassium Chloride, Ferrous Sulfate, Zinc Sulfate, Zinc Proteinate, Iron Proteinate, Zinc Oxide, Copper Sulfate, Manganese Sulfate, Manganese Proteinate, Copper Proteinate, Manganous Oxide, Sodium Selenite, Calcium Iodate. Best Breed Large Breed Dog Diet is formulated to meet the nutritional levels established by the AAFCO (Association of American Feed Control Officials) Dog Food Nutrient Profiles for all life stages. Puppies: May feed up to 33% more than suggested adult levels to maintain optimum body weight. Pregnant Females: Minimal increase needed during first 6 weeks. Weeks 7 through 9 increase up to 25%. Lactating Females: Immediately after whelping nutritional demand increases by 50% when compared to maintenance levels. During peak lactation increase feeding up to 300% of regular intake. Contains 456 Kcal per cup ME (metabolizable energy) and 4.1 oz. of food per standard 8 oz. measuring cup.